Hello everyone! Long time, no blog. I know, I know. Over the past few years, Urbane Animal Behavior has taken a backseat while I was traveling fairly extensively for the ASPCA assisting the Anti-Cruelty Behavior team at temporary shelters with a variety of animals from many different cases involving hoarding, cruelty, dog fighting, rescues and sanctuaries gone bad, and puppy mills. At the end of 2017 I took an Operations Manager position for a dog daycare and boarding facility. I helped create and build that business before it came to an end, so now it’s on to a fresh re-start. Urbane Animal Behavior will be offering a few new services: Board & Train, Day Training, and Day Camp, in addition to the already available: Private in-home sessions, and Group Classes (on a limited basis). I’m also available for speaking opportunities. I’m excited to be presenting at the Prairie States Animal Welfare Conference next week on three separate topics! If you’re affiliated with an organization that would benefit from hosting a speaker with a wide array of experiences and knowledge of many different species, please reach out to me. I will resume deploying for the ASPCA as well, but hope to make UAB the priority. If we’ve worked together and you and your animals have benefited from it, consider liking Urbane Animal Behavior’s facebook page and leaving a nice review. I’m excited for what the future holds, and hope that you’ll be apart of that journey with me. To reach me, click on the Contact tab. If you’re looking for a healthy treat you can quickly make at home, here you go. These DIY treats are easy to whip up, and much more inexpensive than commercial frozen dog treats. 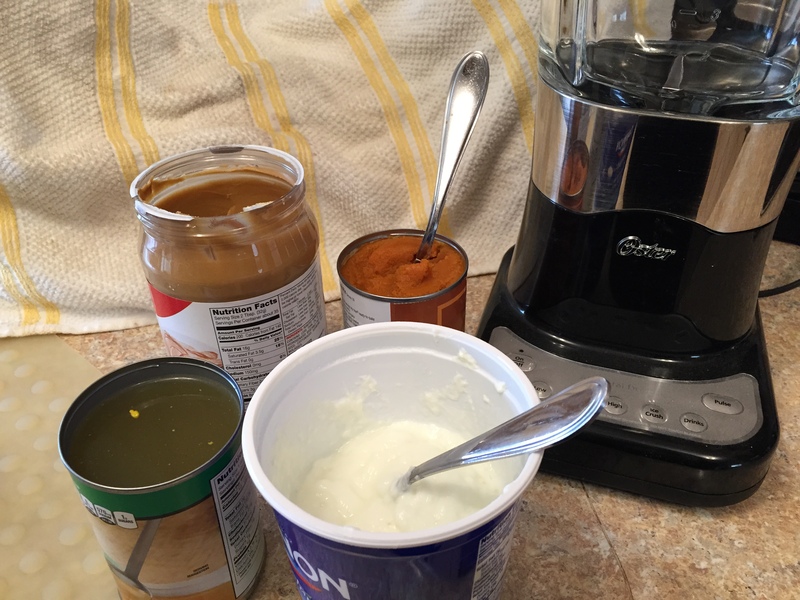 In a blender, combine equal portions of Peanut butter or Pumpkin to Yogurt. 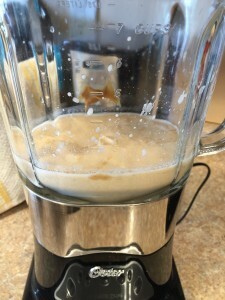 Add broth if extra liquid is needed to make the mixture smooth. 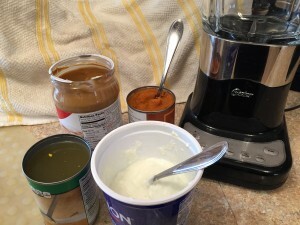 Pour mixture into paper cups. I like to add a biscuit to the top just to fancy it up! Put in Freezer and serve once fully frozen. Our girl typically gets one frozen treat per day. It doesn’t take her long to eat it up, but she sure loves it! Thursday marked two weeks since we said goodbye to our beloved boy, Chance. Some of my readers have met Chance, and knew him personally. He had a way of touching the hearts of everyone he met. Knowing when to say goodbye is a difficult decision. I want my animals to leave this world with dignity. I do not want to see them suffer from pain or fear. It becomes a fine-line often times on knowing when to make that decision, but I’d rather give up a few more days with my companion than to make them hang on for my selfish needs. When you’re given a timeline for the end of a life in advance, you start to think about what it will be like when that life is actually gone. We begin to inoculate ourselves against the feelings of loss and pain. But nothing really quite prepares you. Rather than creating a “bucket list” of activities that would please us, we did things we knew Chance loved. We let him tell us how much he could handle by being tuned in to his body language; after spending nine years together we could read each other pretty well. He decided how long his walks would be, and he let us know when he just wanted to lie in the grass and let the sun beat down on him. We honor our boy by remembering his smile. By remembering how he loved life; he was one of the happiest dogs I’ve ever known. 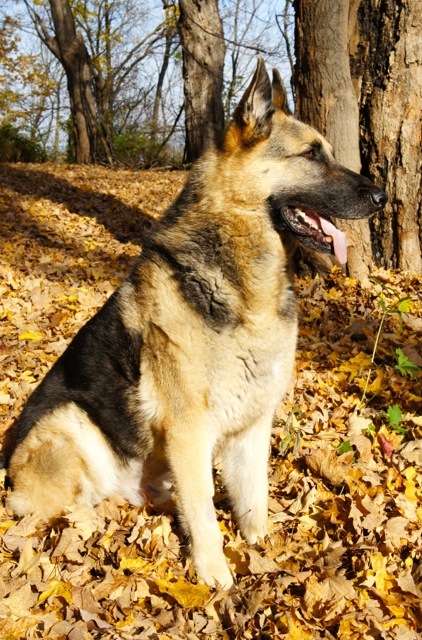 He was a great ambassador for dogs in general, but especially for German Shepherds. 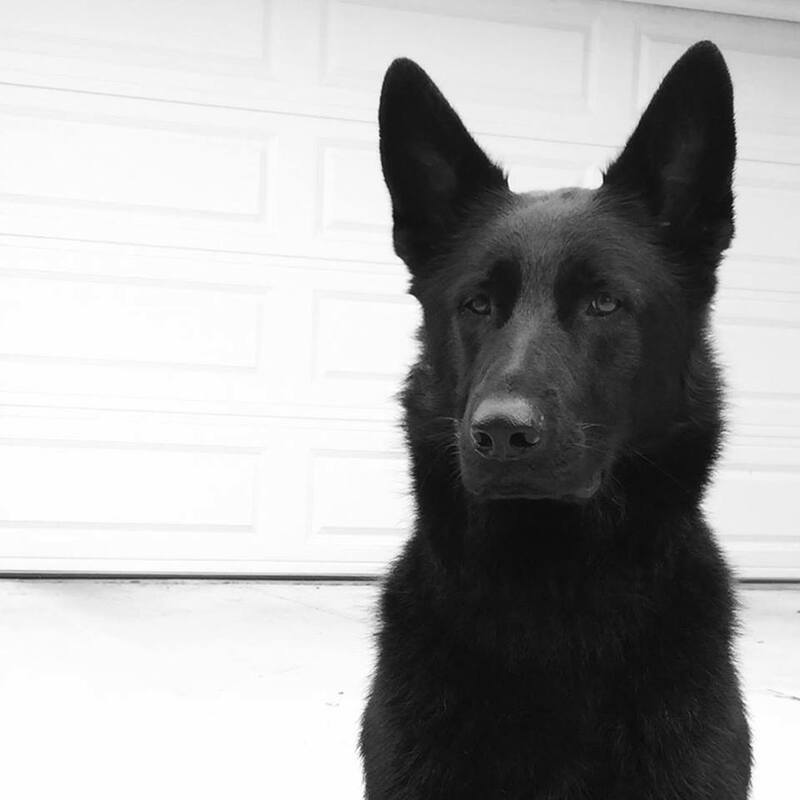 In my line of work, I see many dogs with behavioral issues, and unfortunately I see many German Shepherds that are fearful and aggressive. To have a Shepherd that was outgoing and friendly with a well-adjusted temperament was a treat. 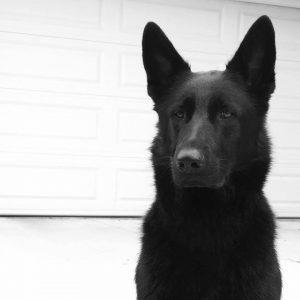 He proved to others that well-adjusted German Shepherds were not mythical creatures. At age nine, competed in Rally and titled Level 1 his first time out! 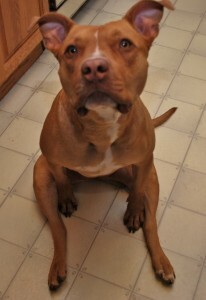 Chance also assisted me with training and assessing many dogs through my rescue work and with client’s dogs. I could use him as a helper dog in just about any setting. If other dogs snarked at him, he’d simply turn and walk away. He was a one-in-a-million dog. Chance was quiet for the most part, except for that Shepherd whine and moan at times (you know what I’m talking about, GSD people). He would only bark if someone came to the door, or when he thought other dogs were starting to play to rough at the park (there was a reason he had the nickname “The Sheriff”). Being a Shepherd, he liked things in order, and he liked having his “flock” in one place. When we would travel cross-county, it was easy to forget you even had a dog with you because he was such an easy traveler. He always impressed my friends when we would grab take-out and leave it in the car with him while we ran into a store and he wouldn’t eat our food. I once left 20 pounds of raw beef in the car sitting right next him, and he didn’t touch it! His only vice was used tissues in the wastebasket and, in his younger years, the occasional pair of underwear. He loved to learn and was often referred to as the “teacher’s pet.” I attribute his attitude and excitement for learning to clicker training. Chance never wore a choke chain, pinch collar, or shock collar after he came into my life. He was a free thinker, and knew how to experiment in his environment when given access to explore and try new things. We would have fun playing new games and learning new tricks. At age nine, he was still learning new things, and teaching me in the process. No one is perfect, but Chance came pretty dang close. From the time he was diagnosed with an aggressive form of cancer, to when we laid him rest at our home, was only one week apart. I never wanted to say good-bye to my dog. It’s unfair really, that dogs don’t live longer. However, I am at peace with knowing I gave him a great life, and a wonderful last week of fun activities, like eating ice cream cones and going for car rides. I honored the look he gave me when it was time for him to leave his physical body behind. Goodbye my sweet boy. You will be forever loved and remembered. Please go hug your loved ones, and give your dog a little extra scratch behind ears for me and Chance. Nothing really prepares you for saying goodbye to a true friend. You can ponder what it’s going to be like, you can try to prep yourself, but when the time comes there is nothing but raw, emotional chaos. Delilah came into my life fourteen years ago. My family had said goodbye to our long-time and trusted companion, Comrade, in early 2000. My mother was missing having a fluffy sidekick around, so it was decided that we would adopt a new companion that summer. We scoured the pet listings looking for possible candidates that met the criteria of being: fluffy, medium-sized, not a puppy, and not too hyper. A rescue near the Twin Cities had a few dogs that piqued our interest, so my mom and I trekked a few hours away to visit them. We met a few dogs before the rescue people brought out a beautiful Aussie named “Nutmeg”. For me it was love at first sight; she was drop-dead gorgeous with a red tri-color, fluffy coat and two different-colored eyes: one blue, one brown! We walked around with her. She was playful and tuned into my requests quickly. My mom was a little uncertain at first. 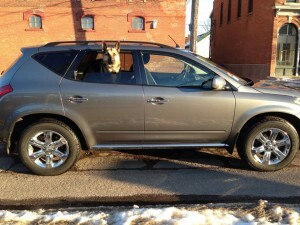 Thinking of Comrade and knowing this wasn’t him made the reality of actually getting a new dog a bit more difficult. As my mom sat down cross-legged on the ground and pondered whether we should take the plunge, Nutmeg came up and literally sat right in her lap and licked her face. It was right then that my mom decided to take a chance on her, saying, “Well, I guess she is making it clear who she wants to go home with”. The adoption papers were signed and our new dog gleefully jumped into the back seat of our car and rode home like a pro. On our drive home we knew we had to rename her, and it was decided that “Delilah” would be her new name. We learned from the rescue that Delilah was surrendered to their care by a woman whom only had Delilah for a short time as a puppy before needing to be hospitalized for dialysis. Delilah had spent much of her puppyhood at the rescue, and was just over one year old when we adopted her. She was incredibly active and über smart. Our first few days with her were a roller coaster as we all learned about each other’s personalities. Delilah chewed through an entire window sill when we left her contained in a bedroom while we headed out to dinner. Thankfully that was the only time she was inappropriately destructive. She ran off on me and sent me on a wild goose chase within the first 48 hours of having her home, but we quickly learned she would always return to the last place she had seen you. Delilah had her mischievous side. My family has all sorts of tales to tell about Delilah and her adventures. She loved to run, and would be so clever about taking off on you. She loved to swim too, and would sneak off to jump into our neighbors pond. The horse water trough was another favorite place of hers, much to the horses disapproval of her hair in their tank. She kept us on our toes, but she also brought us so much joy. Within the first two years we had her, she became a Canine Good Citizen and registered therapy dog through Therapy Dogs International. Before retirement, my mother was a mental health therapist and used to take Delilah with her for individual client and group sessions. Many of them felt more comfortable and at ease with Delilah there. I would volunteer at nursing homes and assisted living homes, where I would take Delilah and my German Shepherd, Indy, for visits with the residents. It wasn’t uncommon for staff workers to comment on how much the residents looked forward to the dogs visiting them, and how some of the residents really only opened up and talked when in the presence of a furry friend. As a dog trainer, I learned many things from Delilah, and she saw me through major life events. It was during our time living together that I became a cross-over trainer and retired my use of choke chains, prongs and other aversive training techniques. She was great proof at the power of positive reinforcement training methods, and how being proactive was markedly more effective than being reactive. I was always so impressed by how quickly Delilah would learn new tricks and retain information when she was motivated by things she found reinforcing. Delilah was there through my dating years, through heartbreaks, when I met my husband-to-be, and when we got married. She was there with me as I went through college, when I opened my pet boutique business, and when I shut its doors. 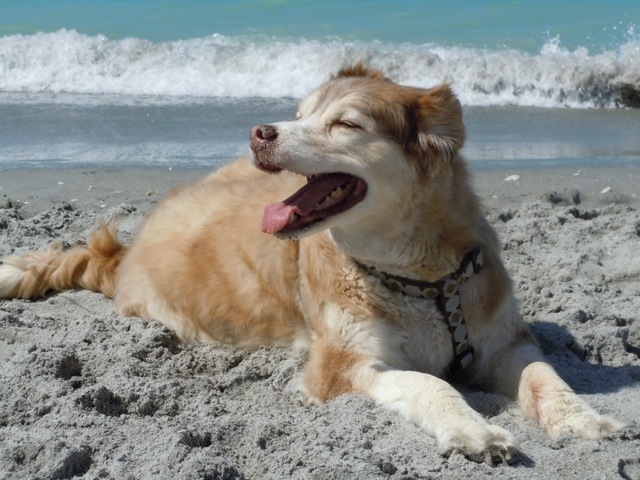 When my parents retired to Florida three years ago, they took Delilah with them; she was, after all, my mom’s dog. I was fortunate to visit several times each year, and have her and my parents come for a visit last summer. During my last visit to FL a few months ago, I knew her age was catching up with her. 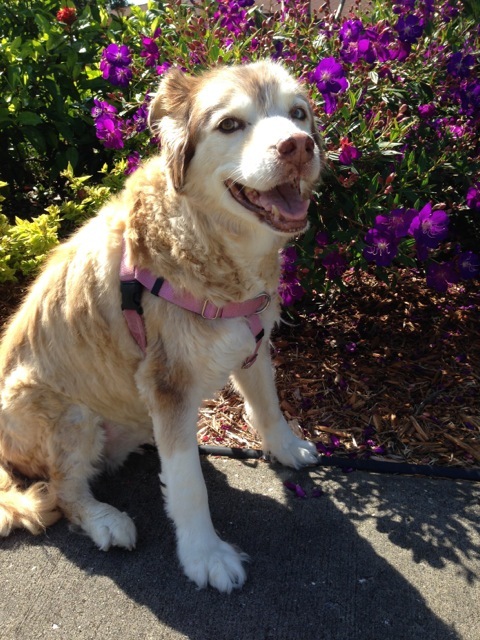 She was slower, she had extra lumps and bumps, and some internal health concerns as well. Not knowing if it would be the last time I would see her or not, I took a locket of her beautiful red hair. For the last several weeks, I knew that Delilah’s health was getting increasingly worse. I wished I could have made one last trip to FL to visit her, to spend time with her, and tell her what an incredible dog she is. Unfortunately that wasn’t going to happen. When I called my parents yesterday and spoke to my mom, I asked how Delilah was doing and my mom said, “Oh honey, she’s isn’t”. Those words will stick with me. Both my parents were with her as she took her last breath; they held her and told her she was an incredible dog, the best dog. More than anything, I wish I could be with my parents right now, but phone conversations and sharing our stories will have to do. To Delilah: You were one-of-a-kind, you were sweet, silly, and smart. Run free Fancy Pants, be free from your pain, and know we will always love you. As I drove my truck into the automatic carwash today and put it into neutral, the conveyer belt grabbed my tire and began to pull my truck forward, I felt my heart rate pick up, and a small wave of anxiety pass over me. I looked down at my shifter twice to make sure the vehicle was, in fact, in neutral. After that brief moment passed, I wondered why I had that reaction? I’ve taken cars through washes for years and never had a second thought about it. Well, I quickly deduced my reaction was in response to my last experience in that exact same car wash from a month previous. I had gone in just like any other time, waiting for the sign to turn from Green-Forward to Stop-Put Your Car Neutral. Only this time I was preoccupied with something, and rather than shift my car into neutral, I accidentally shifted it into second gear. Not realizing this right away because my truck’s tire was blocked and being pulled along on the conveyer system. Suddenly, it accelerated over the block and started moving forward on the track. This wouldn’t be so bad, except for the fact that there was a car only one half car’s length in front of me. I slammed on the breaks, popped the truck into neutral and waited for the next block to carry me out. Although this wasn’t a life or death situation, or super scary, it was surprising and gave me a jolt. Which brings me back to today’s car wash. My brain and body remembered what happened last time, and my sympathetic nervous system wanted to make sure it didn’t happen again. Immediately, I began to think how this relates to our animals. To the naked eye, I’m sure no one would have known that I had a brief moment of “oh crap this isn’t going to happen again, is it?” But that is exactly what I was thinking. If such a minute experience could have that kind of impact on me, what does that mean for our animals? They may have their own versions of these experiences that we are not aware of. Our pets can’t articulate to us what it is that scares them. They can’t always tell us about their previous experiences, ones that may have had lasting impressions on them. Situations that may cause them to stop, panic, flee or fight. It’s up to us as their guardians to keep them safe, and have them feel secure. Taking notice of your pet’s changes based on the environment they are in can give great clues about their comfort level. These subtle changes can help in guiding you while you journey into doing systematic desensitization and counter-conditioning with an animal that is fearful or reactive in an environment or towards certain individuals. It’s beneficial for management too. 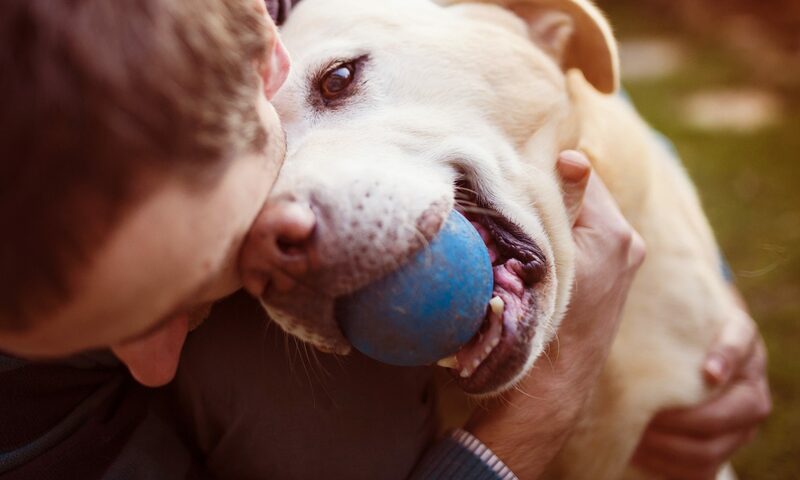 Reading your dog’s body language can alert you as to when he’s had enough social time with his dog friends, or visiting nursing homes… you name it. All animals have their limits, have their thresholds, and need breaks before they reach them. My take away today was to be more aware of how my animals are responding and acting. If something seems to spook them, or they are acting out-of-the-ordinary, then I need to take a step back and access the situation. What was my pet’s response? What was the consequence of the behavior; meaning what happened after my pet reacted? From there I can build ways to prevent the event from happening again, or figure out how to work through it by changing the environment to set my pet up for success. Large, cargo vans driving within 15 feet of the dog and person while on a walk. The dog’s behavior is to stop, crouch and then try to bolt in the opposite direction of the van, but can’t because he’s on leash. So he makes himself low, ears back, tail tucked. After the truck has passed, the dog is hyper-vigilant and reluctant to move. If the person allows any slack in the leash, the dog continues to attempt to bolt with low body posture until the truck is at least several blocks away. Then the dog can relax a bit more and resume going on the walk. 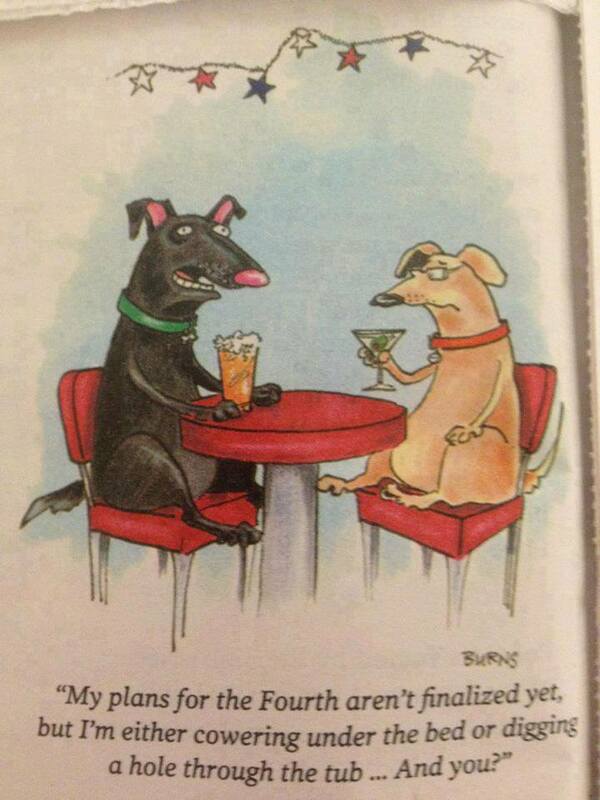 We can change the Antecedent (what comes before the dog’s behavior). That could be accomplished by walking the dog in areas where cargo vans don’t travel, taking that option out of the equation. We could also change the consequence for the cargo van coming near by combining classical-conditioning and desensitization. As of right now, the consequence is that the dog wants to add distance between him and the van, and to do it quickly. At a distance where the dog has not gone over threshold and is still checking in with his person, the person can positively reinforce the dog for noticing the van. They can do this using treats, toys, and adding distance between the dog and the van, meaning the person and dog walk away from the scary van. Gradually they move closer to the van, and the person waits for the dog to communicate that he’s comfortable at that distance before advancing to the next level. Watching for body language signals that the dog is aware of the trigger and choosing a different option than the previous panic and flee is key to knowing when the dog is comfortable and ready to progress. This kind of communication with animals, where they have some choice in the matter and are treated humanely through the process, builds the strongest bonds between people and animals. Obviously this is just a slice of what types of training and behavior modification could be done for this particular case. Next time you’re out and about with your dog, be mindful of how your dog is responding to the environment. If you notice behavior changes, what are they? What can you do to help your dog, or what have you been doing? 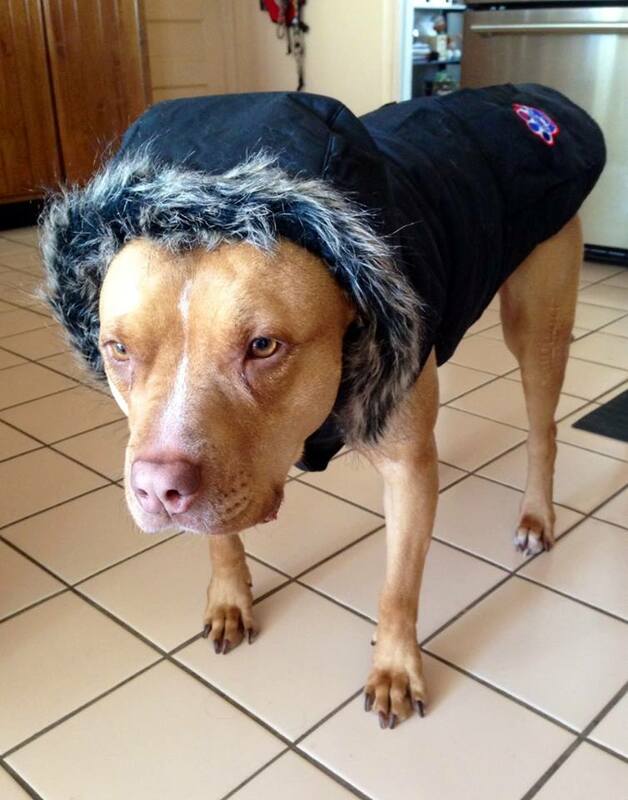 Having a Pit Bull (Or any other shorthaired breeds for that matter) and living through Minnesota winters can be a challenge. A short coat with virtually no hair on the underside makes for a cold dog in no time. Shivering is an obvious sign that a dog is cold, but what are some other signs to observe to determine if your dog is chilled and needs to get to a warmer temperature? Dogs will appear to have a haunched over look; shoulders braced and rear end tucked under. They will hold their paws up individually in the air, alternating between them. Often times dogs will hold their tail close to their body or tuck it to conserve body heat. They may slow their pace on walks and runs. They will also likely have their mouth closed, again to conserve body heat. For dogs with longer coats, it’s not always easy to tell if they are shivering so people need to watch for other signs, and also keep an eye out for snow and ice building up between the dog’s toe pads and/or clumping in their fur. Walking dogs on city sidewalks and streets during the winter can be harmful for dogs’ feet. Places like Minnesota are well salted during the icy, snowy months and the salt can be very irritating for many dogs. Use dog boots when walking in salted areas, and/or with dogs with long hair to prevent snow and ice build up on their paws. Or use a musher’s wax to create a protective barrier on your dog’s paw pads. Outfit your dog with a coat or jacket; preferably one that is water-resistant or waterproof. Keep your dog well hydrated during longer outings. 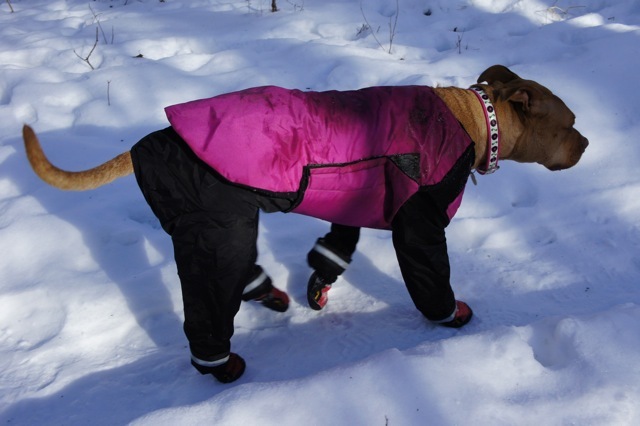 Find trails that are packed down or groomed so your dogs aren’t over exerting themselves in deep snow. Always watch for subtle behavior or body language changes that will tell you your dog is getting chilled. Emma loves running and playing in the snow, but I’m always diligent to watch for changes, since she can get cold quickly. Her knee surgery scars are prone to frostbite, since she has no hair protecting the scar tissue. These are the reasons she wears a full body windbreaker, an insulated coat over top and boots. By taking these measures, she is able to go on longer hikes and romp with her German Shepherd brother who wears none of these items! Happy trails and stay warm. “Register your Service Dog or Emotional Support Animal for Free & travel with your pet” is the ad campaign’s catchy headline that grabbed my attention when checking my Facebook account recently. Curious, I looked up the website to see what it was all about. As advertised, people could simply register their dog with the organization and be listed on their Service Dog Registry. People could also pay to receive kits that included items such as: Laminated ID cards, Official Certificates, and dog vests. Depending upon what items were included in the kit, the prices ranged from $49-$119. As I toured the site looking for information that described the qualifications for a Service Dog, I found nothing. One could just register their dog and claim it was a service dog. There was a drop-down menu of disablity choices to choose from, but nothing else required in the way of proof that your dog was indeed a trained Service Animal. There were directions for people recommending that they have identification on their dog, or a vest to indicate that it was a working dog which would limit questioning by businesses. There was also legal information advising people of their rights: saying that under the Americans with Disabilities Act (ADA) businesses can ask if a dog is a service dog, and what duties does the dog perform. They can not ask a person what their disability is, which I agree with. I’m concerned that people could easily abuse these registries by claiming their dog is a Service Dog, when really they just want their pet dog to accompany them everywhere. True Service Animals that perform specific tasks for their person are highly trained, whether it’s a Guide Animal for the Blind, Impaired Hearing Service Dog, Physical Mobility Support Dog, Seizure Alert Dog, etc.. In many cases it takes months, if not years, to get the animals to the level of training that would qualify them as a Working Service Animal. Under the ADA, these animals are considered working animals, not pets. Also, the ADA does not recognize Emotional Support Animals in the same category as Service Animals. In the case of Emotional Support Animals, businesses do have the right to ask for signed documentation from a Medical Doctor or Mental Health Provider that a dog is providing emotional support. I find this to be a huge disservice, as it has the great potential to harm those out there that do have trained, qualified, working Service Animals. People who truly do have disabilities, where dogs are assisting them and providing them with a better quality of life, don’t need to have the risk of that right being taken away because of someone’s untrained dog. What happens when a pet dog is falsely represented as a Service Dog and is taken into a business establishment where dogs are not normally allowed, and then that dog reacts aggressively towards someone, or towards an actual working Service Animal? Will true Service Animals end up suffering because of other people’s negligence and selfishness? Don’t get me wrong, I’d love to take my dogs with me everywhere, but I know they are not welcome at all businesses and establishments, and for good reason. Not everyone loves my dogs like I do. I also understand that my dogs wouldn’t always be on their best behavior in all situations, and I wouldn’t want to risk my dogs getting harmed, or anyone else getting uncomfortable or even injured because I wanted to have my dog keep me company, or felt sorry for leaving my dog at home. Even if we could take our dogs everywhere with us, would we want to? I ask this because I bet, in many cases, the dog would not be comfortable outside the confines of their home and routine stomping grounds, and would end up becoming more of a distraction for the owner than an aid. Many pet dog owners do not understand common dog body language, and end up missing subtle signs when their dog is feeling uncomfortable or anxious. It’s not until the dog is lunging, growling, or biting that they realize there is a problem, and by then it’s to late. Until establishments openly accept companion animals to accompany us into their places of business, we better be sure the Service Animals we’re bringing inside with us are providing an actual service, are trained for the task, and are well-mannered in all situations. Either we’ve been there ourselves, or we know of someone who’s faced the following scenario: you’re running late for an appointment, you grab your keys and start to dash out the door, and right then Fido rushes past you and out into the great beyond. You call his name, along with a few other choice words, but all you get is the tail and the dust left behind. What to do!?! Through the use of management tools, one can prevent door dashers from escaping by having a double or triple gated system in place. 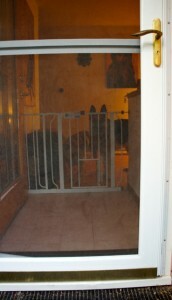 Use of baby-gates and exercise pens can create a second barrier. Tethers and crates are handy for when you know people are scheduled to stop by your home. Prior to the visitors arriving, you contain your dog by leashing/tethering, crating, or closing him into another room of the house. Practice doing this when people are not coming over as well, so that your dog isn’t predicting that crate time means people come over and there’s a chance to escape; he may start evading the containment system you have. 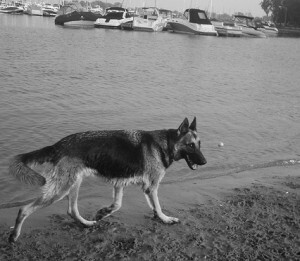 Management will be necessary when first starting a training program, and for some dogs a form management may always have to be in place, because escaping out the door and running has been to highly reinforced in the past. 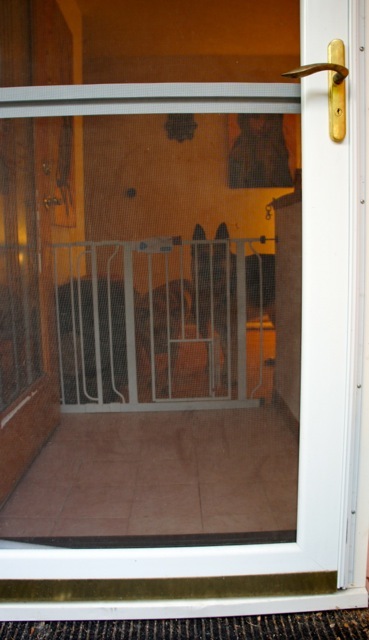 With your tools in place, have people come in and toss treats away from the door–back towards the inside of the house to get the dog focused on the floor and moving away from the door. 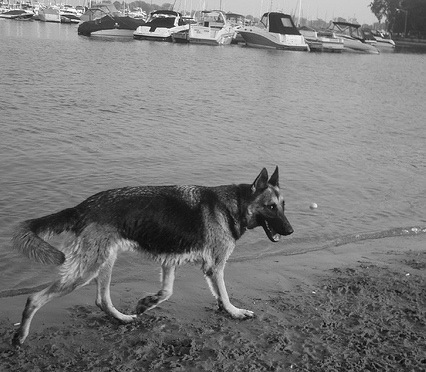 Teach a strong “recall” with your dog. Teach a “U-turn” cue as well (turn, face me, and give me your attention). Attach a long, drag line to your pup, and work on recalls from the doorways. Uh oh, he got out! If your dog does get past you, have treats and a few favorite toys stashed by each entrance so you can quickly grab your dog’s attention and reward him for it. Do not chase your dog, this will kick in the play drive of “come and get me”, or it may spook your dog if your dog tends to be fearful. Instead, grab the goodies and see if you can distract him. Once you have his attention, move away from your dog. This sounds counterintuitive, but many times dogs will follow you because they’re curious, or if you run from them you may kick in the chase drive. If you can, run into an open garage or fenced in yard before tossing treats on the ground to distract the dog. If you think your dog will follow you right back into the house, awesome, try it! Some dogs LOVE car rides, so grab your keys and jump in your car. Drive around and when you see your dog: stop, get out, open the back door and in your peppiest voice, ask him if he wants to go for a car ride. Many dogs will run right over and jump in. Don’t scold or reprimand him if he turns around and comes back to you! This is hard one for people sometimes, especially if they’re already running late or have something important happening. If you scold a dog for coming back to you, he’ll associate returning to you, not running away with punishment. Next time, he’ll be more leery to return to you. Last of all, if you know you have a dog that is inclined to be a door dasher, be sure he’s ALWAYS wearing a collar with current ID tags, and is microchipped. That way if the above management, training, and tips to get him home fail, you’ll have some comfort in knowing he has proper ID on him so if someone finds him, he’ll be returned quickly and safely. This post is two-fold, the first part discussing how feeding people food to your dog won’t teach him to beg, unless you’re reinforcing a begging behavior. The second part is teaching a begging dog not to beg: Zen Dog Training–If you want something, act like you don’t want it! Dogs learn within context, and continue to do things that are reinforcing to them. Meaning if I feed my dog or give him attention while he’s begging, than yes, I’ll teach him to beg rather quickly. This is why having young children and dogs together can create a begging dog in no time flat, since kids often drop food either intentionally or unintentionally and the dog quickly learns that hanging out by the kids yields them lots of yummy morsels. Let’s examine the people food controversy for a moment. What do you think your dog’s food is made out of? When you look at the ingredient list, if it’s a high-quality food, you’ll see a protein source: chicken, duck, lamb, or beef as the first ingredient; followed by a carbohydrate of some sort: rice, potatoes, peas, or quinoa, and the list goes on. So when we feed our dogs pieces of chicken, hotdog, cheese, etc…, we’re really just giving them the core ingredients of what they’re already receiving in their daily diet. Some would argue it’s a better way to feed our dogs–less or no fillers, or preservatives. 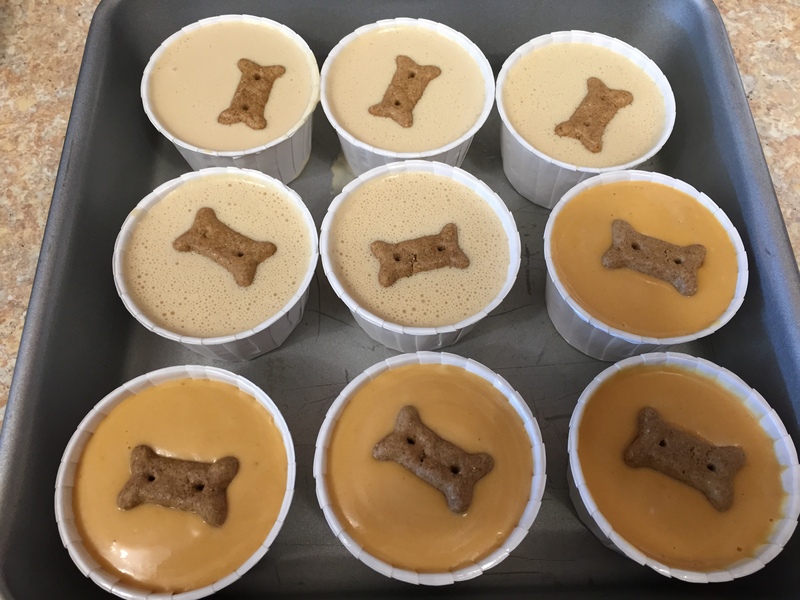 Feeding the core ingredients is likely higher-value than their regular kibble or dry biscuits though, so you will generate more interest from your dog when using people food. How do you prevent your dog from begging? Don’t feed him when he’s eliciting attention from you; like starring, pawing, or barking. Teach him to sit or lie down on a bed, and reinforce him while he stays there. 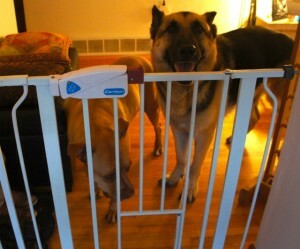 Manage the situation by tethering, crating, or using baby gates if your dog is too eager to be right next to you. Again reward him when he’s settled and not begging. Tonight I practiced the Zen Doggie Game with my dog, Emma. I had a bowl of popcorn-a favorite snack for both me and the dogs-Emma was sitting next to me and staring. So I started the Zen Dog Training with her. If she was going to get any popcorn from me, she needed to act like she didn’t want it. I waited for Emma to look away from me, as soon as she did, I marked it with a Click and treated her for position, meaning I delivered a piece of popcorn to her mouth with her head turned away from me. I could have tossed the popcorn away from me as well, but I had other animals in the room that may have competed for it. After a few Clicks, she started to catch-on and would actively turn her head away from me. To be sure she wasn’t going to chain together the behaviors of look at “mom” first and then turn head, I started to Click her when she kept her head turned away. This is how you can teach a dog not to beg. Simply reinforce the behaviors you like, and ignore the behaviors you don’t want. If you don’t want your dog staring at you, then don’t give him food or attention when he’s doing so. Either ignore the begging behavior, or cue him to do something else instead and reinforce that behavior when it happens. You can feed your dog from your plate by marking when he gives you non-begging behaviors, and then toss the food away from where you’re sitting. Ta-da! Give it a try, and let me know how your dog did!